A promising career in the theatre was cut short when Harold Chapin was killed in action at the Battle of Loos, France, in 1915. He joined the Royal Army Medical Corps in 1914 and died attempting to save a comrade. Although he was an American born in Brooklyn, he left for England with his mother at an early age and worked for the most part in the British theatre. One of his first parts in Shakespeare was as Young Marcus in Sir Frank Benson‘s Stratford production of Coriolanus; he was seven at the time. 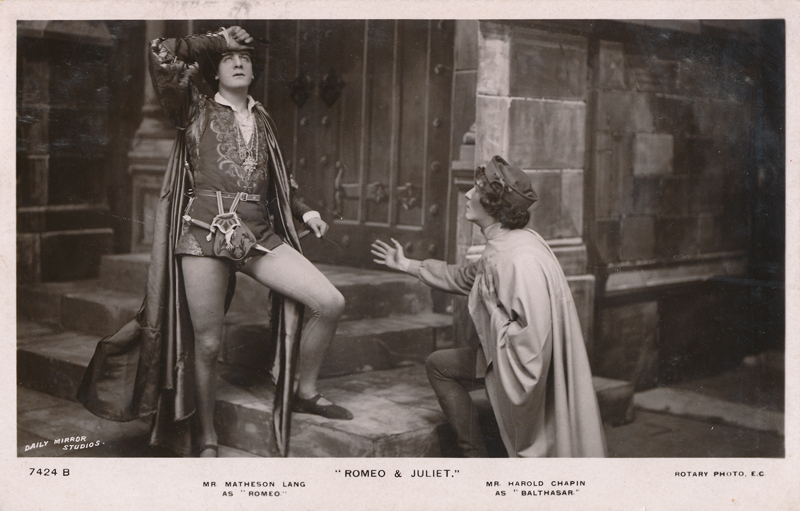 He later played Balthazar in Matheson Lang‘s Romeo & Juliet at the Lyceum in 1908. Although he played a number of parts his talent as an actor was described by most critics as “modest,” but he made his career by writing sixteen plays, ten of which were produced during his lifetime. A notable achievement was his collaboration as stage director with Granville Barker and Lillah McCarthy; he worked with them in 1912-13 at The Savoy on their groundbreaking productions of The Winter’s Tale and Twelfth Night. His obituary appeared in the The New York Times on October 9, 1915, and an article entitled “The Story of Harold Chapin” was published in the same paper on December 2, 1917.